Last week I scattered in my front driveway the last of the dried out field corn that I acquired from my friend Henry Russell in Prairie du Sac, Wisconsin last fall. My feral animals enjoy this very much, but it takes them a day or two to discover it. This morning it was all gone; each husk was stripped clean. There were a couple of loose kernels left, but they will be gone tomorrow as well. The rain today is fast melting the snow away, and the mild weather brings the smell of Spring in the air. The damp rotting leaves from last fall still litter the ground. The block of blue salt is much reduced as well, and I will need another one from the Co-op next fall. The next time clock for mother-nature is the ice on the lake. This may be gone by the time I get back from the Windy city Book show next week. It is still cool enough at night for a fire. In the two months leading up to Christmas Eve, I was treated to a double computer crash, recovery proved impossible, so purchased a new machine, and subjected the other two to low level formats. With the new version of Windows Seven, some of my trusted programs didn’t work anymore, and I had to purchase replacements. I also had to upgrade to the latest versions of Wordperfect X5, Adobe Acrobat X Pro, Adobe Photoshop and Adobe In-Design. This process necessitated my extra trips to the Big-Smoke (Toronto) for parts and visits to the computer doctor at the Lung Association. At the moment I have a lot of unhappy customers since the bookhouse is chock-a-block full of new boxes of books that all need dustjackets, and a stack of orders for fulfillment — long overdue orders! I have also been working away at the art of e-books. I think I have mastered the hurdles of Adobe.pdf files, with graphics and bookmarks, importing them into itunes, and the masterfully insightful bookshelves on the iPod itself. I had originally planned to travel over the holidays, because I had deliveries to make in Sauk City, Wisconsin and Chicago, but this did not happen, instead the day before Christmas, a light blanket of white snow arrived, and the chill of cold weather which has finally frozen the lake in front of the house. The front curtains are now closed since they offer another layer of insulation from the cold through the windows. The two events that highlighted the holiday for me were: a Christmas Eve Carol Service at St. John’s United Church in Flesherton, and a Turkey Dinner on Christmas Day at the Gentle Shepherd Community Centre. Indeed, this was an event to remember! It had been organized for a number of years by Nelson and Wendy Weber, but this year they had a number of volunteer helpers headed up by Kim Lucas and her husband. The tables were preset in the basement with Christmas cheer, including Jelly Beans. The meal was a sit down and not buffet; There was lots of delicious, home-cooked turkey, with all the trimmings, homemake cranberry sauce, mashed potatoes, kernel corn, turnip, sweet potatoes, and an excellent turkey dressing, as well as a great selection of homemake pie and cakes. Every attendee left with a Christmas present. Now that the computer is back in order, I will continue to work on The Wodehouse Bibliography, and get ready to celebrate Sherlock Holmes birthday in New York in the middle of January. I was invited to the preview of the new Sherlock Holmes movie, and the allusions to the Canon were superior to the first one, but the level of gratuitous violence should attract a youth audience, and hopefully lead them to the ready of the real McCoy. The high-point for me was seeing Stephen Fry, plump and past his prime in the buff. Now it is time for a walk. I will particularly look for the various animals tracks in the newly fallen snow. I bought 50 pounds of carrots and a large salt block for the deer who frequent the old apple orchard behind the cottage. it is also time to put another log on the fire. I live on a property with a 100 foot frontage on Lake Eugenia, and it runs back to the road about 250 feet. It’s Spring here, and the crosuses along the driveway are in full bloom — purple, violet, yellow and white. The daffodiles and tulips are sprouting through the fall leaves, and are about two weeks away from bloom. You will notice at the top of the small patch of crocuses they is a black outline. 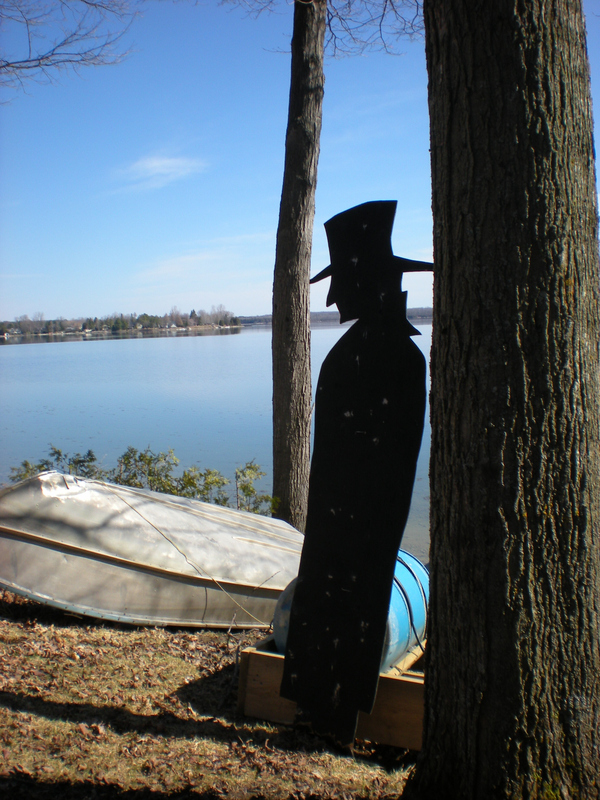 Ths is the back of my Dr. John Watson silhouette who collapsed over the course of the winter. I shall resurrect him shortly when the weather improves. At the entrance there is some debris from the missed garbage put out by my neighbour who rents the cottage over the winter. Rather than complain, it will be easier to collect it myself with a green garbage bag in hand. There are the usual twigs and branches fallen with the winter ice on trees and wind. One tree has snapped off altogether, and is hanging suspended over the driveway only supported from falling altogether to the ground by the adjacent treetrunks and branches. Walking down behind the bookhouse I find a large patch of residual snow beneath the cedar hedge that edges the property. Maybe winter isn’t over after all? Last year at the rock and stone quarry I acquired a number of patio stones, which had cracked or fractured in the wrong place. I thought they would make an excellent irregular patio around the poetry bench, but never got around to placeing them. They are all piled together ready for placing. I inspected the top of one of them, and noticed a fossilized snail. I wonder how long ago this little fellow lived upon the face of this earth? When I returned to the cottage, I discovered my neighbour, a feral cat on the deck looking for a meal. When I approached she made her getaway. I wonder if she wanted some of those kernels of corn, and I’ll put a fresh batch of ears out a little later. Finally I came in to find a bat flying around the cathedral ceiling. From time to time a bat falls into the cottage through the chimney, especially when it is not in use. the bat landed, a blue towel was thrown over it, and then placed outside on the deck. The little fellow rested there for about an hour, flapped his wings, opened his mouth, and made strange with me. I initially though the fellow was in ill health, but it flew away never to be seen again about an hour later. Over the past week, I have been watching the ice melt off Lake Eugenia. On Sunday I saw free water around the shore line, and then some free water in the middle of the lake. Not a good idea to walk on the remaining ice! It was a sunny day yesterday, and the ice all appeared to be gone. The water was flat, but there were a number of wind squalls that made their way across the dark blue water — swirling, twisting and turning. The crows were making merry with the dried ears of Wisconsin corn that I had placed in the bird feeders. They would sweep down and pick at the ear when I wasn’t present on the deck. When the ears disappeared altogether I surmiss the local squirrels and chipmunks walked off with them. I also noticed the resident muskrat swimming a little off shore and diving to rise 50 feet farther along. Likely having his/her lunch before breeding. Now today it was relatievely warm and sunny. I could now hear the waves of water lapping onto the shore. The water level has risen, along with the spring run-off. I sat on the deck and contemplated nature. Somehow it never seems to let you down. It is all-powerful, and a wonder. But one should never forget, that our neighbour to the South is now engaged in no less than three wars around the globe. The last one was initiated by the gentleman that received the Nobel Peace Prize the year before. I wonder how History will interpret this apparent oxymoron. I also reflect on the terrible evolving situation in Japan. It is also an overwelming situation, and I was influenced by the content of an e-mail from a friend, and I include it here to close. 10 things to learn from Japan – SKYNEWS reported this few days back. Disciplined queues for water and groceries. Not a rough word or a crude gesture. Their patience is admirable and praiseworthy. They showed magnificent restraint in the bulletins. No silly reporters. Only calm reportage. Most of all – NO POLITICIANS TRYING TO GET CHEAP MILEAGE. With their country in the midst of a colossal disaster – The Japanese citizens can teach plenty of lessons to the world. 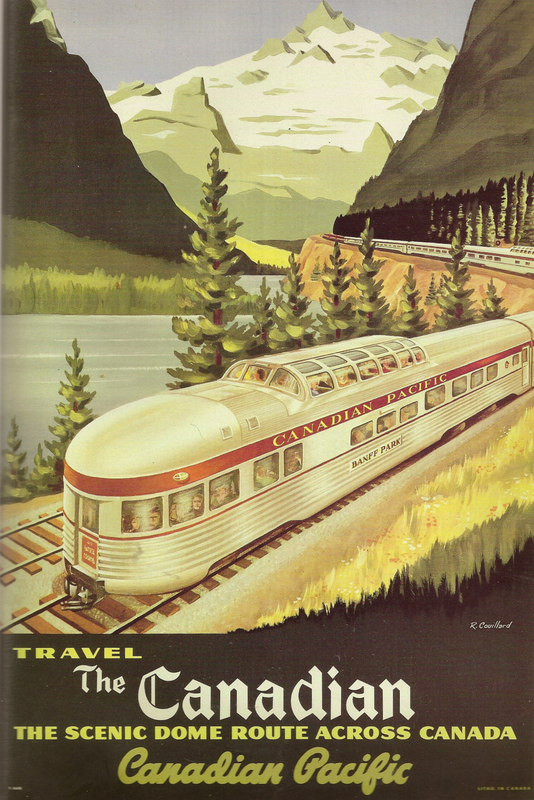 When I was attending The University of Toronto, I spent my summers working for The Canadian Pacific Railroad working as a Dining Car Waiter on board The Canadian, travelling from Toronto to Winnipeg and return via Sudbury. It was four days of work every eight days. We spent two nights on the rails; and one night in the staff bunkhouse near the station, or in the CPR Winnipeg Hotel which is now torn down, only to catch the east bound train the next day. I learned that I was not a poker-player, travelling the rales those summers. I also learned how to work hard, do the dishes, garnish a cheese tray, eat lots of turkey, set tables, balance a tray stacked with four orders of food, and all this on no sleep! I remember taking a taxi to the local L.C.B.O. in Fort William. I remember those baskets of wild blueberries for sale when the train stopped around the Canadian Shield. I remember alot of things, but then I suppose, I have forgotten some things along the way. The exuberance of youth: the infirmities of age! Between the 3 serviings of breakfast, lunch and dinner, the dining car crew travelled back and forth to the crew car at the head of train to rest, or alternately sat and gossipped in the dining car. The passengers frequently passed going to the Observation car in the middle of the train or the Observation car at the rear of the train. Some passengers would ask — “What the name of the lake?” that we were travelling beside. I learned that the answer to that question no atter who asked was “Moore Lake.” When that passenger passed again usually walking in the opposite direction; the unprompted reply would always be “and that’s Stilmore Lake” pointing to another body of water on either the same side, or the opposite side of the train. Now what does that expression really mean or imply? — “got up early” — “enthusiastic to get the events of the day underway” or perhaps — “after a restless night” or maybe — “awakening after a long debauch the night before” and then again — none of the above. But I rolled out of bed early this moring walked to the ocean patio door, peered out and saw the saw sitting on the eastern horizon of the Atlantic Ocean, an orange circle, with a yellow orange haze. Time for coffee and orange juice — e-mail, facebook groups and this blog. It’s my 64th birthday today. A wonderful selection of useful presents and a card awaited me after the morning swim in the heated pool. Now the plan is to pack a picnic lunch and take a drive along the 10 miles of the ocean’s beach at New Smyna Beach. It’s overcast but some cars and families on the beach already.